She came in like a veritable wrecking ball, but just don’t ask her to crowd surf. Meet this month’s fashionista Skip Chick, the lovely Megan Wharmby! Hi Megan! Let’s start with your age, and where you work. 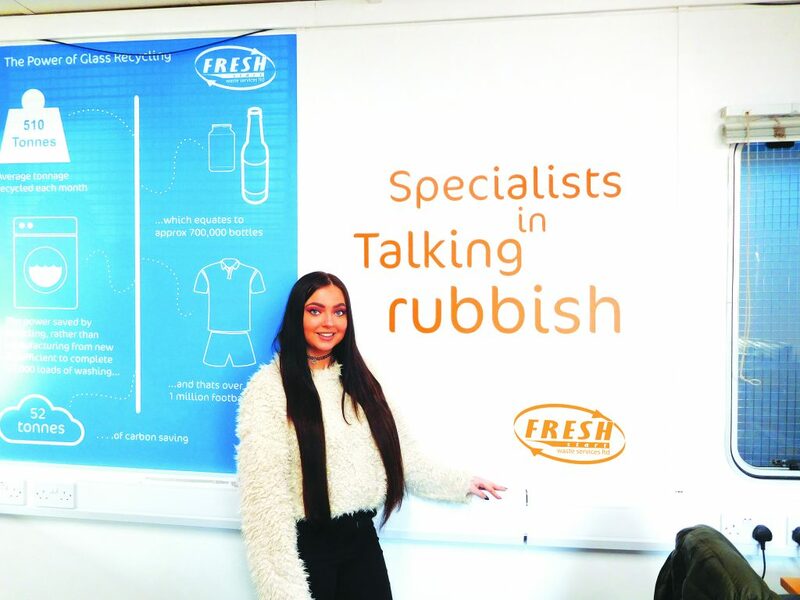 I’m 25 and I work for Fresh Start Waste Services Limited in Manchester. I’m Transport Co-ordinator. Bet you almost never get tyred by that. How’s that been for you? Three years of bliss! My role includes speaking to our customers, helping out the drivers and working on ways to ensure we provide the best service possible. Imagine you have a lot of happy customers! What do you love most about your job? My Fresh Start family for sure! Group hug!! Anything you don’t love? Yep, if only there was a Transport Co-ordinator around to sort it all out…that aside, what’s the most memorable thing that’s happened at work? I walked in on my old boss on the, ahem, loo – that was pretty embarrassing. Yikes! Not sure whose bowels would be moving fastest in that situation. Let’s leave work, what are you up to? I love experimenting in the kitchen, binging on Netflix series, and having girls’ nights out. Thai veggie curry – I’ve pretty much mastered it now. Just an extra-large portion for us, as we’re cutting down so much we’ve faded away to shadows. What’s the craziest thing you’ve done? I was at a festival once and crowd surfed when Snoop Dogg was on stage. Unfortunately, I didn’t get very far! Romance is in the air – how’s it going? Definitely going for amazing food with champagne, fireworks, the lot. My ultimate girl crush is Miley Cyrus, so I’d have to choose her. Hope she stops talking long enough for you to get a word in…. Imagine you had superpowers – apart from shutting her up, what would you do? I’d just have to be a mermaid so that I can talk to all the sea creatures. Heard the one about the two goldfish in a tank? One turned to the other and said: “You man the guns, I’ll drive”… Boom boom! Okay, never mind…got a theme tune for us? “Who run the world” by Beyoncé, Just because she is a queen. Move over Queen B, Megan’s in charge – if you ruled the world, what law would you introduce? Every workplace should have a puppy! We just love puppies here. Yes, and locks on the toilet doors…ever met anyone famous? No, but I’d love to meet Beyoncé. Thought you might. What’s best, social media – or being social down the pub? Social down the pub with the girls. Get a cheeky drink in for us. Pint of vodka and coke to get over this job. Imagine your Lottery numbers come up, what would you buy? Aw! Now tell us something fascinating about yourself. I studied fashion at university. How absolutely riveting! We’re very impressed. Ever had any fashion disasters? I’ve had everything from broken heels to split dresses. Maybe best sticking to co-ordinating transport then. What three words describe you? Funny huh? Well here’s your big chance… Go on, make us laugh. I hear a round of applause every time I open my cooker door…I think it’s a fan oven. Well, we’re certainly your biggest fans. Thanks for being a great sport, and a fabulous Skip Chick. Fresh Start Waste Services, Astley, Manchester.